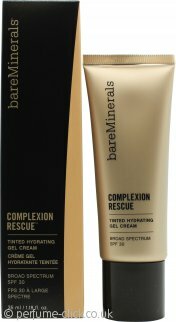 bareMinerals Complexion Rescue Tinted Hydrating Gel Cream SPF30 35ml - 4.5 WheatGreat looks natural. Love this but I find I do need to wear a moisturiser under this as well other wise my skin looks a little dry! The texture is light and It gives you a natural look. SPF30 is one of the reason I got it, I normally use it before I apply a non SPF foundation on my face and it works perfectly.